This is a site about the great Nycander family started in December 2006 by Christian Persson (a Nycander descendant) living in Solna, Sweden. I was fortune to find an old book by Oscar Nycander(1857-1932) about the Nycander family´s development since 350 years back, printed only in 250 copies . This book was published in 1909 but is still an enourmous source of information of the Nycander family. The book is very rare. It was dedicated to Lagrelius, Axel (1863-1944), famous cartographer in Sweden who also worked at the Swedish court. The book is now published in pdf-format at this website after scanning. The first Nycander was Petrus Laurentii Nycander. He died 12th of June 1679 in Nyköping , Sweden. He probaly took the name Nycander. According to Oscar Nycander he was born Petrus Laurenties Nycopensis. 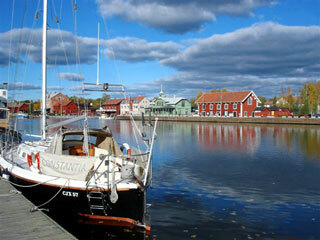 And the name Nycopensis probaly came from the Swedish town Nyköping. In the end he was principal of the Nyköping school. I have structured this site in different parts, Oscar Nycander and the book in pdf-format, pedigrees, royal ancestors and geographical pages as the Nycanders has squattered throughout the globe. There have been many Nycanders over the years that have been succeful in the professional life. One example was Colonel Carl Nycander who was a warrior in Sweden for many critical decades in the end of the 1800th and in the beginning of 1900th century. Almost all Nycander from the countries below has links from him. He was for example commander at Hangö fästing in the end of the swedish time in Finland. In May 2007 I visit Carlstens fästing at Marstrand outside Gothenburg where he was commander between 1811-1826. This was a very important point from where the west of Sweden was defended. The picture below is from his commandant building. Sweden, Peru, Australia, Finland, Canada, USA . France used to be but right now nobody is living there,. There are also some descedants living in Uruguay, UK and Tanzania. Maybe also in Spain. After finding the book I started to publish pedigree´s about the Nycander´s starting from the first Nycander in the following link. From the start I deceided to write in english as the Nycanders is based in several countries (there is also a button on top if you want an automatic translation in for example to spanish). Right now it consists of over 1000 people and are still growing thank´s to a lot of helpful relatives in the Nycander world. I publish family data like dates photos and stories. This is really the core of Nycander.nu. My aim is to get a complete pictures of all descedants and add on as many photos and relevant data as possible. Press the button after the name of the person and you can move back and forth through the generations. The background program that is used is called DISGEN, a program for genealogist from where I have enter Nycander data and generate part of this website. For the actual site I am using NVU-program. I have made a special PDF-familytree in A0-format starting from Carl Nycander and forward as long as I have data. As this is dependent on the family data and this is changing and I don´t have any automatic function please contact me via mail. I can send you a pdf-document but if you want it on paper you surely need help from a printing company. The printout has been distributed to some Nycander descedants and I belive it has been very appreciated. A nice gift. Welcome to write your comment of this site in the guestbook or send me a mail. See the slideshow based on some Nycander pictures from the last 200 years. There is a street in Hangö, Finland that is named after Carl Nycander since he was the last commander at Hangö fästing. It is called "Nycandersgatan" which is swedish for Nycander street. See the maplink here. There is a lot of people that has contributed to this site and I am also looking forward in future cooperation. Thanks to Oscar Nycander, Birgitta Persson, Sharon Neville, Gaby Callaghan, Eduardo Nycander, Ginny Fraser, Roni Mellon, Roy Morris Nycander, Stefan Gemzell, many other relatives in Peru , Sweden and in the US.